Decluttering has its ups and downs. There have been moments of sadness, tension, and anger as well as moments of laughter and joy. When we disagree on the usefulness of an item, or the placement of an item, or when we try to negotiate with a child, it can get rough and tempers can flare. Of course, we are also face to face with our own shortcomings and fears in this process. However, there is the pure bliss at a finished room, or even a partially finished room. There is the astonishment to see how much lighter we are, and the humor found in the “what was I thinking when I picked that up?” moments. Then there is the delight in finding forgotten or misplaced items. Luigi found the other glove he has been searching for. The Dude had bought a thing for the Weber grill, but it got squirreled away and then when it was bonfire time (we make wonderful bonfires in our grill), he was wishing he had bought it, but h couldn’t remember if he had or not. Well, it turns out that he had, and I found it still in its original packaging. Note: he purchased it used at Goodwill still in its package. As for me, I love birds and bird feeding. I have been struggling to find nice, functional feeders at Goodwill for a while. I get a lot of those little drip types that leak all over and bring ants and steal my joy. I had finally found the Perky Pet glass feeder at Goodwill for $2 or $3 this spring. A happy find, it is on my deck, it doesn’t leak, and I have a hummingbird who visits. But I would like more than one feeder. I have been vexed by this issue for a few weeks. Should I try to make one? I have some beautiful glass ball feeders, but they are the drip type that leak. So, I have been trying to figure out if there is somewhere I can hang them where they wouldn’t leak, or something. Well, Sunday night, we were on phase one cleaning and decluttering of the Lego Room/Skunkworks workpod of Magnus. I was going through and thinning the board games that we never play. I go through phases of buying them because they look fun and what a great way to spend an afternoon and wow, only $2? Family fun for $2? What more could you ask for!? But then we RARELY play games together and so they all sit. Anyway, upon thinning, I came across a box, and what did it contain? 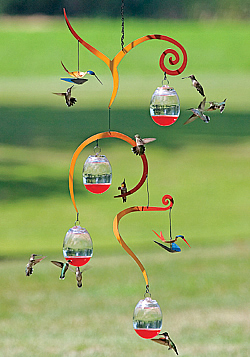 The most fabulous hummingbird feeder ever! It is beautiful, it doesn’t leak, and I bought it sometime in the winter from Goodwill for $5. That was a huge splurge for me, but it was so pretty. Now it is hanging on my front porch, my Perky Pet is hanging on my back deck and I can free myself of all of my feeder failures. And still receive the thrill when I see the $70 original listing price on the website. I cannot believe I forgot about this one so completely. I want to assure my readers that my house is not like level 5 clutter or anything. When I read these posts, I get concerned about myself. We have always been able to have people over, even throw decent sized parties, and get the house quite tidy for visitors. It is just a too much stuff+busy lifestyle bad combination.